A pick-up truck is always going to look like a pick-up truck however much of a deal its creator makes about it being premium. It’s worth noting, however, that both manufacturers are betting on these vehicles being more of a lifestyle accessory than an outright workhorse, so neither are available with a single-cab body. In short, if you’re after a long loading bay you’ll need to look elsewhere. 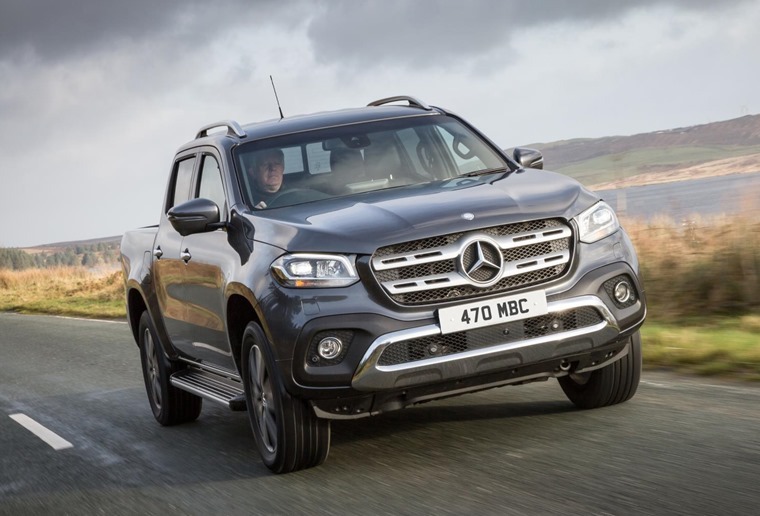 Ok, the Mercedes X-Class might share a platform with the Nissan Navara, but for outright style, it’s in a different league and beats the Amarok hands down. Why? Well it’s hard to beat the three-pointed badge for starters, while the huge grille certainly gives it a road presence other pick-ups can’t muster. 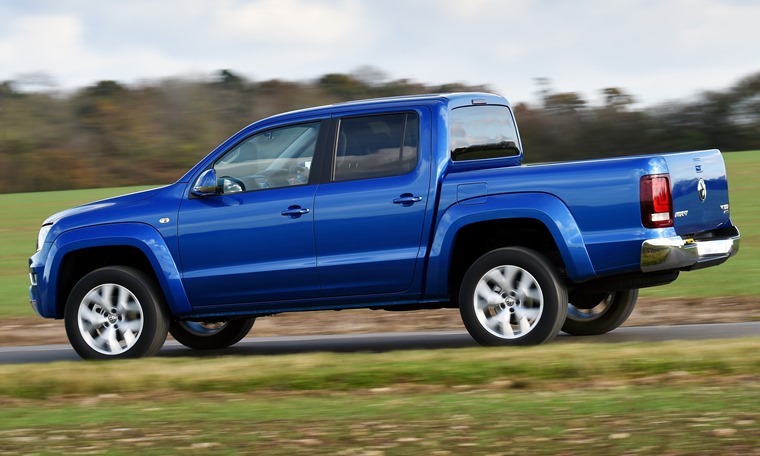 Comparatively, the Amarok looks a little plain, but that’s not necessarily a bad thing. It still has a premium air to it, but in a much more low-key way than the Mercedes offers. It’s a bit like comparing the new A-Class and Golf in that sense; if you’re an extrovert, you’re going to prefer the Mercedes every time, but the Golf still exudes a certain perception other brands can’t muster. You’ll find design features and tech from the companies’ passenger cars inside, albeit a generation or two behind. 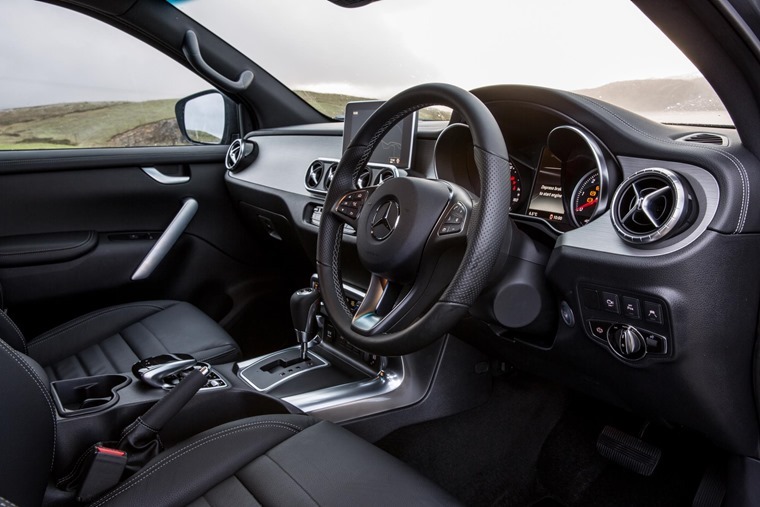 Step into the Mercedes and those carryovers are obvious: familiar infotainment and steering wheel controls and that central touchscreen reminders that this is a pick-up aiming high. The X-shaped air vents are worth a mention too, and the dash can even be specified with a woodgrain-effect material. When have you ever heard of a pick-up truck with that on the options list? If you’re used to an E-Class, however, some of the plastics used might still come as a bit of a shock. The rather out-of-date look of the automatic gear lever serves as another reminder to its Navara-underpinnings, too. But, as pick-up trucks go, this is the new benchmark in terms of style. In terms of outright quality, the Amarok is equally impressive. It might not be as flash as the X-Class, but the plastics and finish are certainly up to the same class-leading standards. It’s clear that Mercedes has decided to go down the comfort route though, while Volkswagen has kept things more workman-like and offered a more practical, usable cab that you wouldn’t be scared of ruining with muddy boots. Under the bonnet of the Amarok you’ll find a 3.0-litre V6, while the Mercedes makes use of a smaller 2.3-litre four-cylinder although it’ll be joined by a V6 option soon. The VW’s unit is offered with either 202bhp and 500Nm of torque or 222bhp and 550Nm of torque. Being a V6, it offers a smoother delivery of power than the Mercedes, with its 2.3-litre four-cylinder offering up to 188bhp and 450Nm of torque. As a result, the Amarok is quicker, getting a 0-62mph time of 8 secs in its most potent form, while the Mercedes takes 11.8 secs. But let’s be honest, that’s not what pick-up trucks are all about. Engine aside, on the tarmac the X-Class is the more refined vehicle courtesy of a more advanced suspension set-up. 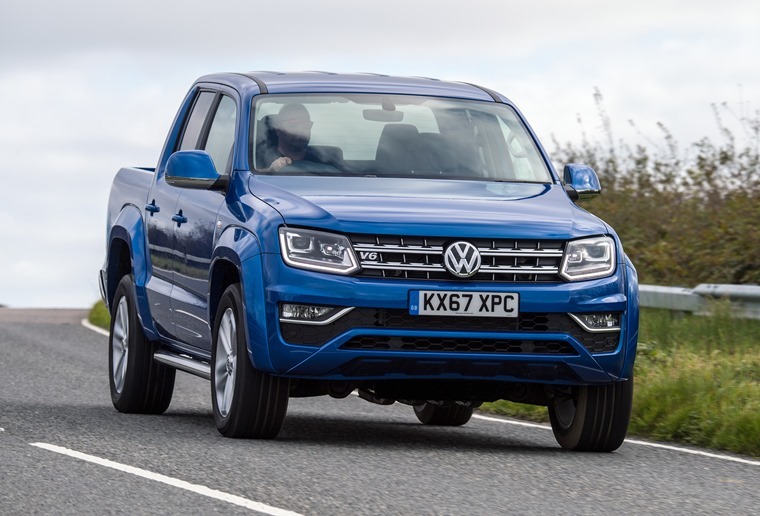 This reduces body roll and, while you’re still very aware you’re in a large pick-up truck, a lack of road and engine noise means it feels great for long journeys and is a more enjoyable drive than the VW. It’d be nice to have a little more power for overtaking, but the imminent arrival of a V6 should address that. The Mercedes might behave better on the road, but off the beaten track its selectable four-wheel drive system isn’t quite as astute as Volkswagen’s 4MOTION permanent system you’ll find in the Amarok. There’s not much in it though, with both being more than happy to take on slippery steep ascents without trouble (unless you’re Howard Ritchie). 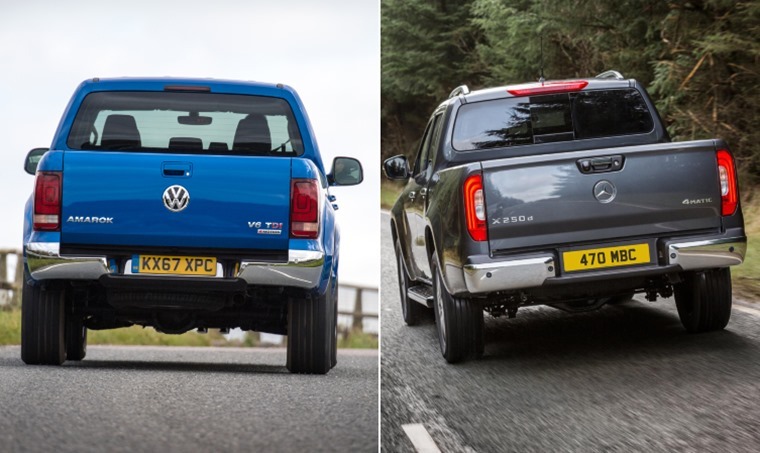 If you’re really interested in the off-road stuff, the Amarok gets a better approach angle, but the Mercedes beats it on paper for ground clearance, wade depth, ramp over angle and departure angle. 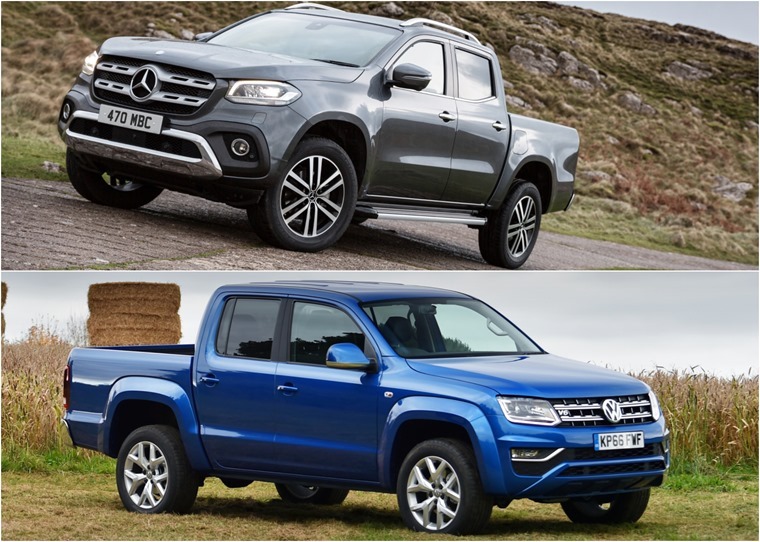 The X-Class and Amarok tow 3.5 tonnes and 3.1 tonnes respectively. 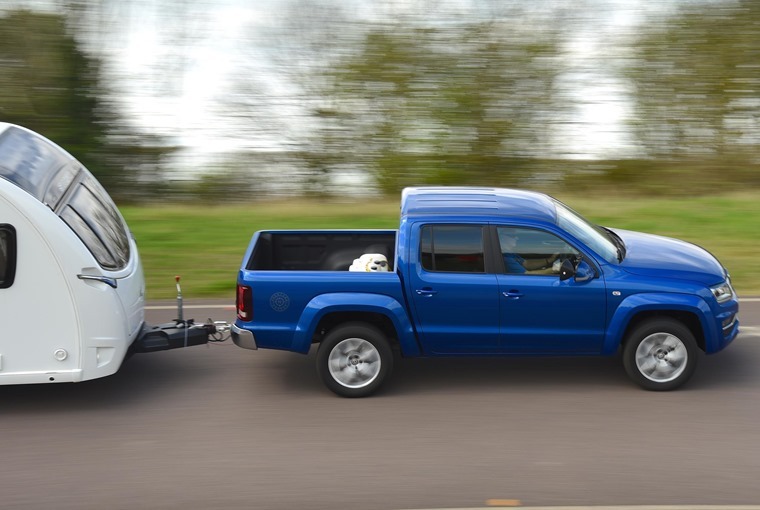 But despite the X-Class’s more impressive limit, if you tow regularly we’d still choose the Amarok with its hugely torquey V6. 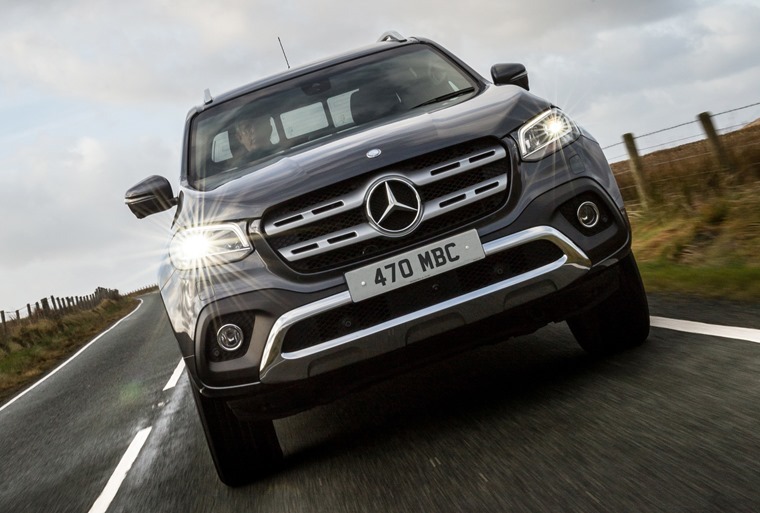 Unless you want to wait for the more potent X-Class to arrive, that is. While you might not consider a pick-up to be the atypical company car, thanks to the tax savings on offer they’re becoming an increasingly popular choice. No surprise then, that Volkswagen and Mercedes are both offering double-cab upmarket pick-ups with car-like qualities. Because they’re classed as a light commercial vehicle means they get a fixed flat BIK rate – that means a 20% tax payer will pay only £670 per year – or around £55 per month. In contrast, a Seat Ateca 2.0 TDI costs £141 per month. But which one is cheapest when it comes to leasing? Well business leases for both can cost from less than £300 per month for both, while personal lease rates are available for less than £400 per month. So, if it’s a business lease you’re after, they should both definitely be on your radar. However, as a personal lease, the rates can be less appetising. But if you have your heart set on a premium pick-up on a personal lease, we have a feeling you’ll be going for the Mercedes. So which one’s best for you? Well if premium really is what you’re after, it’s likely to to be the X-Class. It exudes quality and has a certain special quality to it that no other pick-up truck – including the Amarok – has done before. The driving experience is as car-like as any commercial vehicle has the right to be, too. However, while the Amarok misses out on the Mercedes’s polished feel, it’s still a cut above the rest and a viable alternative if practicality is more of a priority than the badge. You’ll also get more power for less money, and you won’t be too concerned with getting it a little muddy like you would with the Merc. So it really depends what you’re after. Want a down to earth practical workhorse that has a Germanic quality feel to it? Go for the Amarok. A lifestyle vehicle that just happens to be an immensely capable pick-up? Go for the X-Class.